Cajanus flavus DC. nom. illeg. -> Cajanus cajan (L.) Millsp. 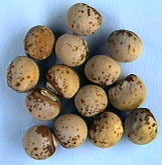 Cajanus indicus Spreng. nom. illeg. -> Cajanus cajan (L.) Millsp. SYNONYM(S) : Cytisus cajan L., Cajanus cajan (L.) Druce., Cajanus cajan (L.) Huth , Cajanus cajan (L.) Merr. See var. cajan for common names. SYNONYM(S) : Cajanus indicus Spreng. var. maculatus Kuntze, Cajanus striatus Bojer, Cajanus bicolor DC. CHINESE : Chi dou, Chi xiao dou. ENGLISH : Congo pea, Spotted pigeon pea, Red gram. Considered by many authors as a synonym of Cajanus cajan ... (Arhar Group) ? Type : Arhar (late-maturing) (Northern India). Photograph of an unidentified cultivar with bicolour seeds. CHINESE : Huang dou shu. ENGLISH : No-eye-pea, Yellow-flowered pigeon pea, Yellow-seeded pigeon pea, Yellow dhal (India), Green pigeon pea (ingredient - fresh seeds). Considered by many authors as a synonym of Cajanus cajan ... (Tur Group) ? Type : Tur (early-maturing) (Central & Southern India). SYNONYM(S) : Cajanus cajan (L.) Millsp. ARABIC : Bisillah hindîyah, Lûbyâ sûdânî. CHINESE : Mu dou, Shu dou (Taiwan), Huang dou shu, Chieh tu (? ), Chieh tu tzu (? ), Shan tou ken (?). DUTCH : Struikerwt, Katjang goedé (South-East Asia). ENGLISH : Angola pea, Congo pea, Guandu, Gungo pea, No-eye pea, Pigeon pea, Pigeon pea bush, Puerto Rico pea, Red gram (India). FRENCH : Ambrevade, Pois d'Angola (West Africa), Pois du Congo, Pois cajan (Belgium Congo). HINDI : Toor, Tuur, Tur, Tuvar, Tuver. ITALIAN : Pisello d'Angola, Pisello del tropico, Caiano. KHMER : Sândaèk dai, Sândaèk kroëb sâ, Sândaèk klöng. MALAY : Kacang kacang dal, Kacang hiris, Kacang kayu (Indonesia), Kacang gude (Indonesia), Kacang Bali (Indonesia). Kachang kayu (former spelling), Kachang gude (former spelling), Katjang Bali (former spelling). PORTUGUESE : Feijão-guandu (Brazil), Guandu. SPANISH : Cachito, Fríjol de árbol, Frijol de la India, Frijol guandul, Frijol quinchancho, Gandul (Puerto Rico), Gandules, Gandules verdes (ingredient - fresh seeds), Guando, Guandu, Guandú, Guandul, Guisante de Angola, Guisante de paloma, Guisante gunga, Guisante gungo, Planta de guandú (Argentina), Quinchocho, Quinchoncho (Venezuela), Vaina del guandú (pods). THAI : ถั่วแระ Thua rae, Thua maetaai, Ma hae. VIETNAMESE : , , Cay dau chieu, Dau thong. Photograph of leaves, flower and pods at University of Florida. SYNONYM(S) : Atylosia platycarpa Benth. ENGLISH : Flat-seeded pigeon pea ? Hô Pham-Hoang, 1991, An Illustrated Flora of Vietnam, Set 1, Vol. 2. (Most text in Vietnamese). USDA, ARS, 2000, National Genetic Resources Program. Germplasm Resources Information Network - (GRIN). [Online Database] National Germplasm Resources Laboratory, Beltsville, Maryland. Available: www.ars-grin.gov/cgi-bin/npgs/html/taxdump.pl?cajanus (20 January 2000). van der Maesen L.J.G. 1989, Cajanus cajan (L.) Millsp. In : van der Maesen L.J.G. & Sadikin Somaatmadja (Editors) : Plant Resources of South-East Asia N°1 . Pulses. Pudoc Scientific Publishers, Wageningen. pp 39 - 42. Contributors to this page (Personal communication) : Takako Asaoka, Orarat Mongkolporn. Note : type names need to be clarified : Tur / Toor (early-maturing / short duration), Medium duration, Arhar / Arhur / Urhur (late-maturing / long duration) Hindi names ? It is reported that 10 maturity groups have been identified in Indian conditions. These 10 groups are narrowed down to four as : Extra early, Early, Medium, and Late maturing. Any Hindi name for any of those ? Of course these may or may not translate well in other parts of the globe. This is why more taxonomical / horticultural work needs to be done. Cultivar groups have not yet been worked out.